As I drive through lush valleys, farmlands and rolling hills, I often contemplate how much I’ve changed. Many years ago, this kind of travel would have been a total bore to me. I was always about the beaches. If a beach wasn’t involved then the trip wasn’t worth it. Now, when it comes to road tripping, I favour heading inland to the open spaces, the mountain vistas, and the rainforest ways. When Logitech approached us about testing their Zero Touch app on a road trip, I immediately headed for the country. Where have we not been yet? We’ve explored almost all areas within a four-hour drive from us. Where could we go that was new? 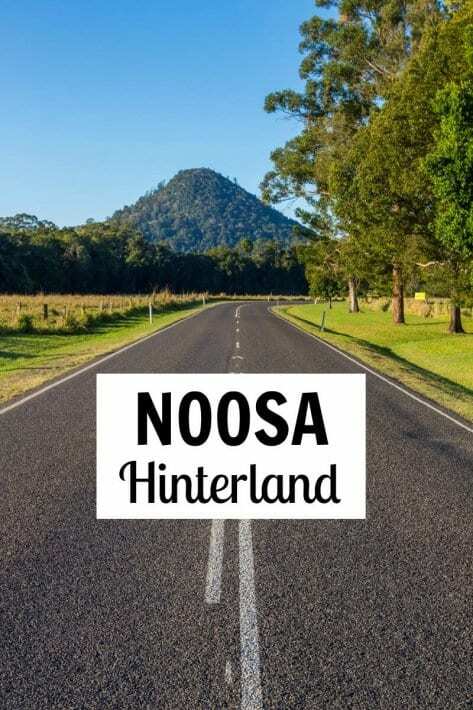 Recently, we learned about the Noosa Hinterland, and how it was a destination on the rise. 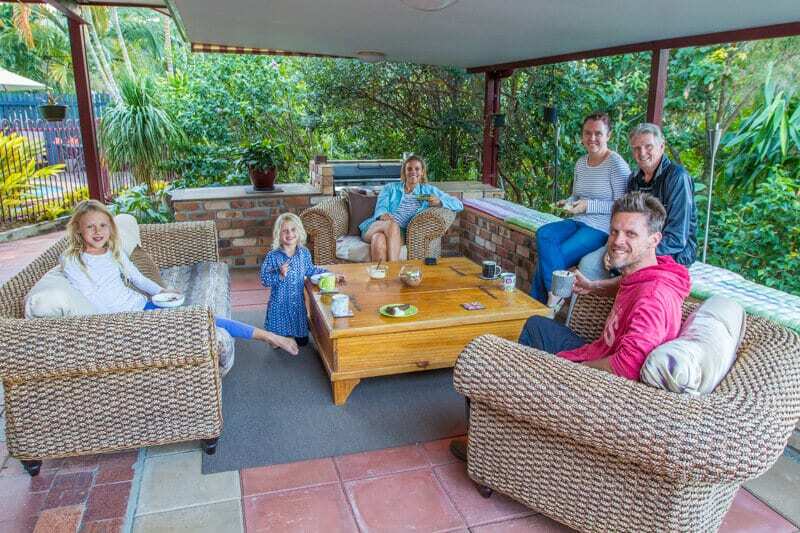 We’d experienced, and loved, the other side of the Sunshine Coast Hinterland in the towns of Montville and Maleny, why not go a bit further north and see how it compared? 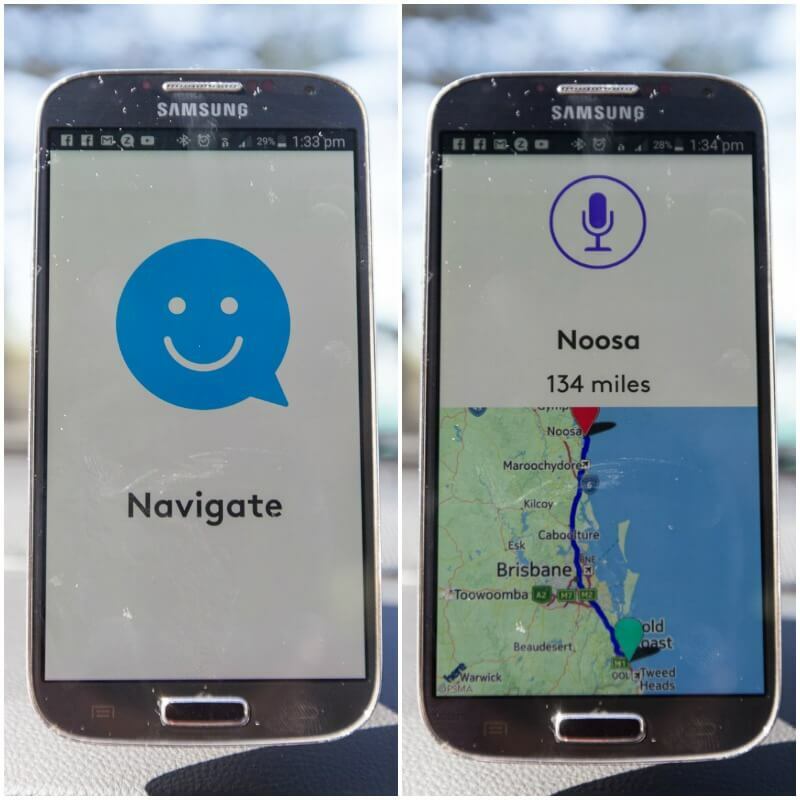 So we packed the car, installed the Logitech Zero Touch app and set off last weekend for a Noosa Hinterland getaway. The Zero Touch is a smart car phone holder with voice-command app that allows you to talk, text, navigate, and play music on Spotify hands-free, so you can be safe behind the wheel. 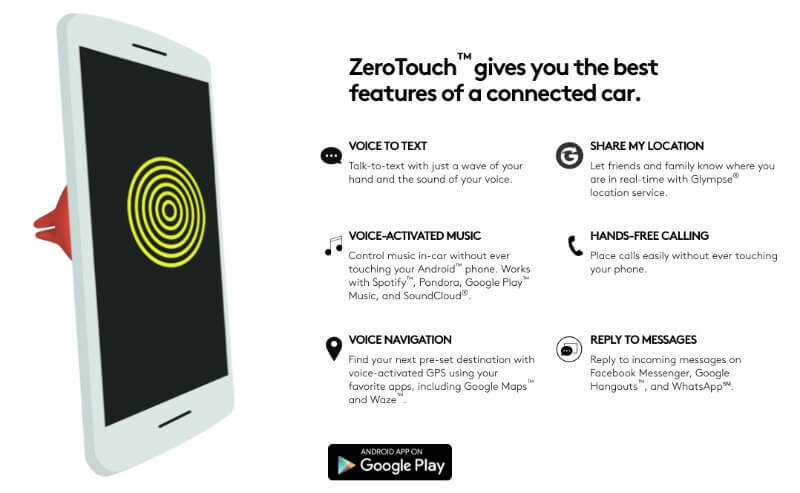 ZeroTouch app brings blue tooth capabilities into your car so that you don’t have to risk fiddling with a phone while you’re driving. We all know how much technology is a part of our lives now. It’s how we talk, send messages, listen to music, and find our way around. We all know the dangers of touching your phone while driving yet many people continue to do it so they can service their needs. Even cars that have their own blue tooth capabilities don’t have zero touch capabilities. You still have to push a few buttons and look at the screen and away from the road. It only takes a split second. I don’t text and drive, but I can still get distracted by pressing answer on a call, even though it’s on speaker, or worse trying to find my favourite song. Logitech have created an app and a Bluetooth car mount to solve all those problems. It’s voice activated so you don’t need to touch any buttons. If you already have a Bluetooth system in your car it can sync through with that so you can use the car speakers. Loud music on a road trip always wins. 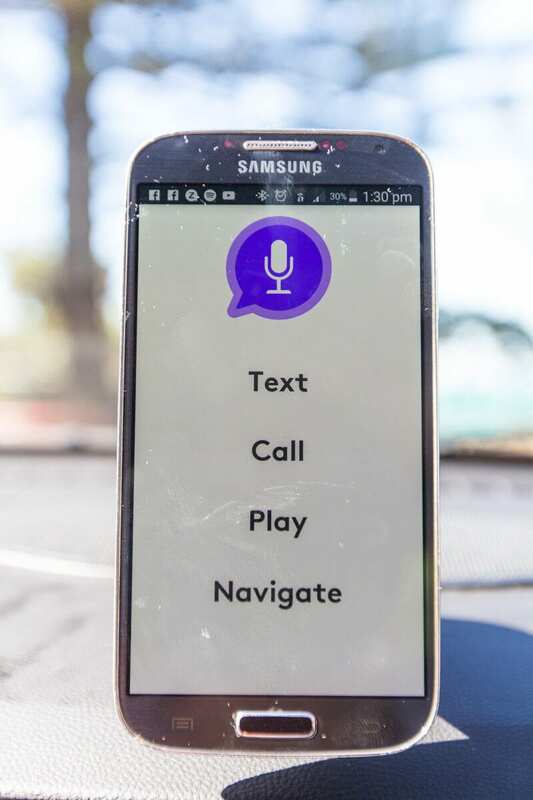 You install the app on your Android phone and connect it to the mount on the car, which has the bluetooth system in it. A lady walks you through the set up making it clear and easy to follow. Once it’s set up, when you want to interact with your phone, you simply hover your hand over the ear piece (top right corner) of your phone and it activates the app. Then you speak your commands play, navigate, call, or message. You do get a warning when setting up the app that it’s not perfect and they’re always working to improve voice activation. I liked that warning, which prepares you for a few hitches that might come your way. When the app lady did not understand what we were saying, I was patient and tried again. From now on I’m going to call the Zero Touch lady, Veronica. She was fun and deserves a name. It took us awhile to find our groove with the ZeroTouch and learn how it worked, but once we did we really liked it, and it made the road trip easier and fun. 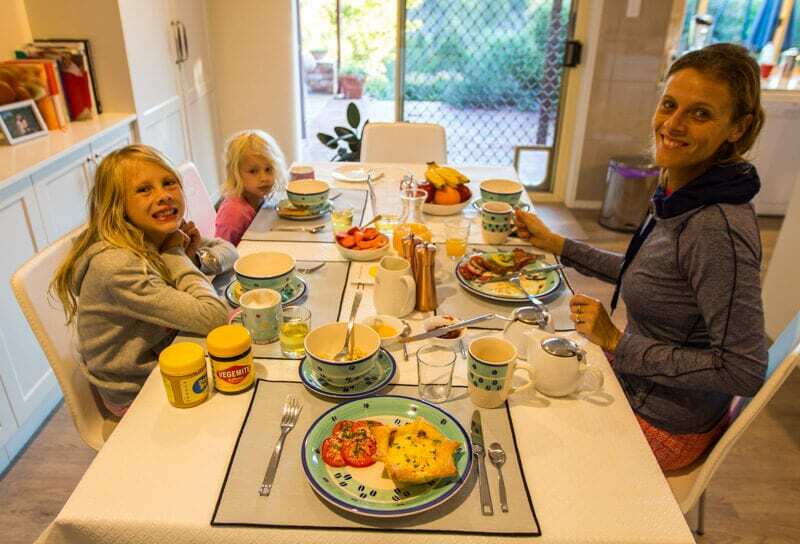 We only had one moment, when requesting navigation to our B&B accommodation in the Noosa Hinterland for the evening where Veronica did not understand our accent. We figured it out the next day though and she found it on the nav for us. Every other time we spoke “Navigate” and told Veronica the address, she found it pretty much straight away. There was some confusion at times when Savannah would pipe up in the back yelling out instructions and confusing poor Veronica. The girls loved the Zero Touch app and wanted to take over it every time we got in the car. Particularly the music. Kalyra and I were competing each time, Play Katy Perry on Spotify. “No Kalyra I’m sic of Katy Perry,” Play Red Hot Chili Peppers. Boom! So when you use the Logitech Zero App be aware Veronica also knows Red Hot Chili Peppers as just the Chili Peppers. Of course, that’s what I’ve always called them. “Not yet.” A few tunes later on comes the peppers latest, Dark Necessities. The Logitech Zero Touch led to great conversations and giggles. A crisis was averted as we all cracked up. 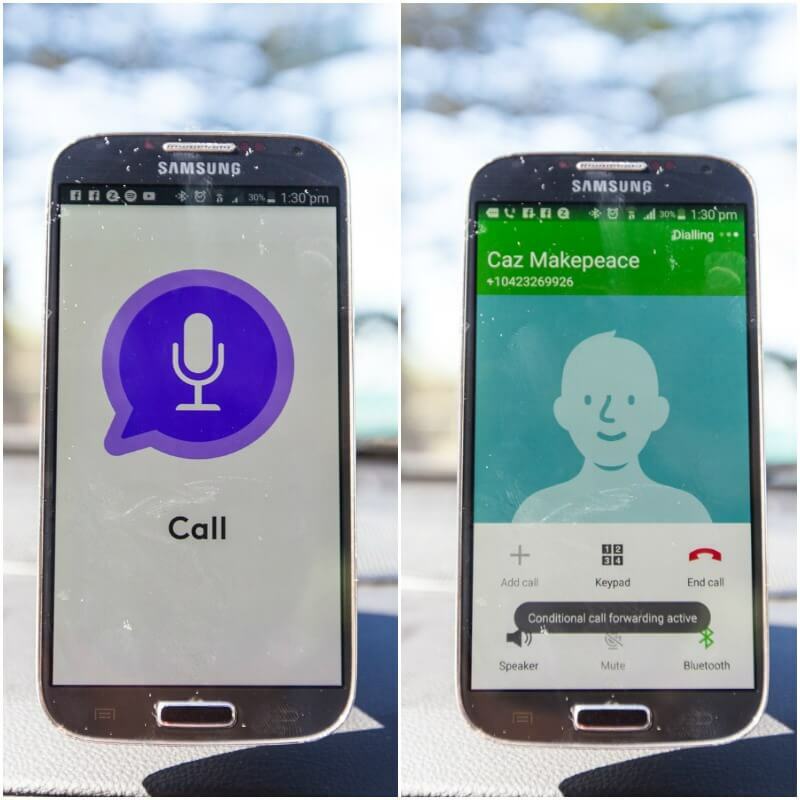 The Zero Touch app makes receiving or making calls easy. You simply wave your hand over the top right to activate it, and speak “Call Caz” then it finds that person in your phone book and calls it. Or, Send Mum a text message. It then asks what you want to say. It repeats it back to you and you verify yes or no if you want it sent. It also reads out your Facebook messages and you can repeat the same thing if you want to reply or not. It will be just as funny to you as autocorrect messages! She amazingly gets the majority of your message correct. Just a couple of words may get mixed up. Send it anyway and have a laugh with your mates. Zero Touch is a great app and is definitely a keeper for our planned US road trip. It allows you to continue to use your device for important things like Chili Pepper songs, without jeopardizing your safety. Apart from a few teething problems with repeating a few instructions, it works pretty smoothly. But, thanks to the forewarning and previous experience with voice activation, you’ll go into it knowing it’s not perfect and willing to work around it. 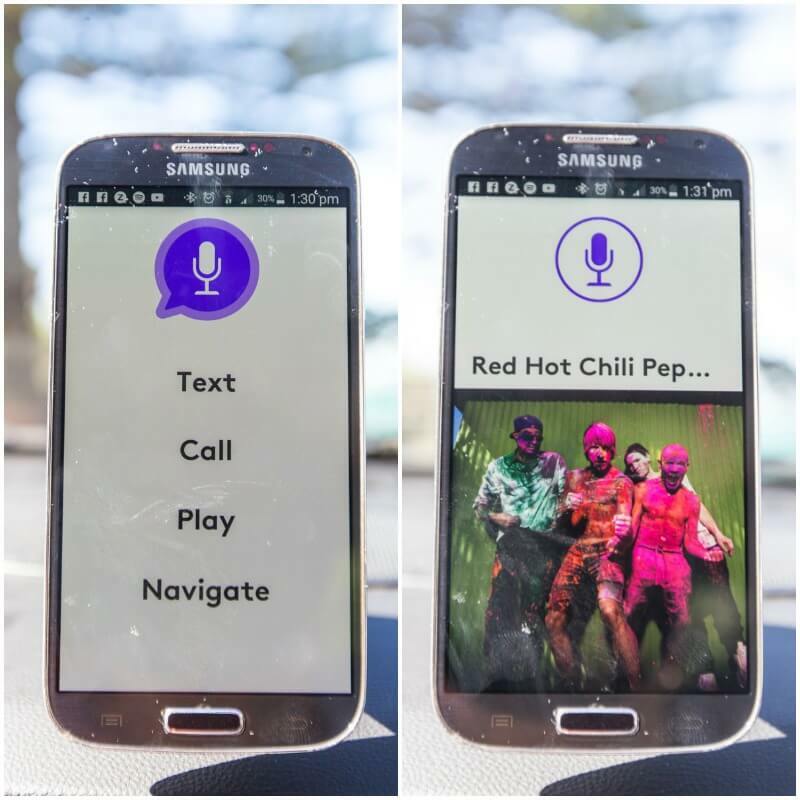 After activation and giving a command like Navigate, wait until the purple circle flashes. That means the lady is ready to listen. If you jump in too quickly, it will cut off your words so Boreen Point will sound like Reen Point to her. 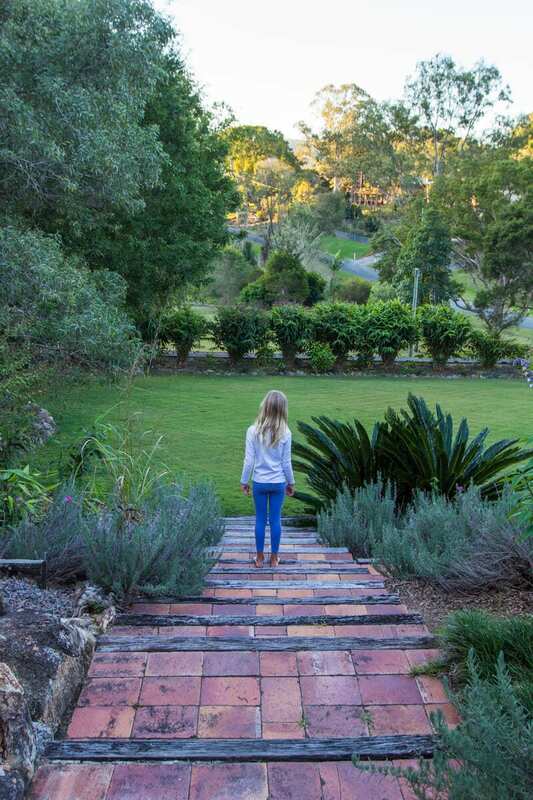 Now let’s have a look at what we did in the Noosa Hinterland. If you are driving to the Sunshine Coast from the Gold Coast, we recommend leaving as early as you can. We thought we left with time enough to beat the traffic but we didn’t. 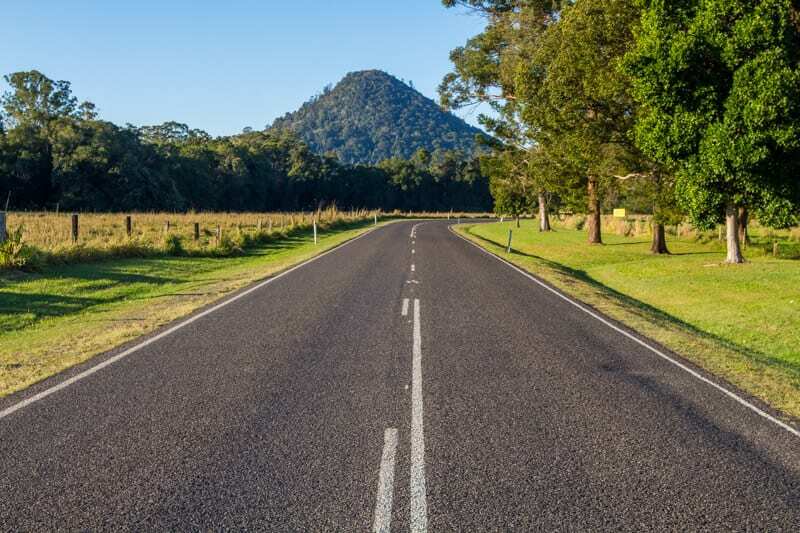 I’m not sure if it makes any difference, to be honest, as I always seem to get stuck in traffic near Brisbane airport as you head to the Sunshine Coast. I think it’s one of the worst roads in Australia for traffic jams. We left after lunch, in hindsight, I would have let Kalyra have the full-day off school and left tin the morning. Lucky we had our music to keep us company and funny Veronica responses to alleviate the traffic tension. 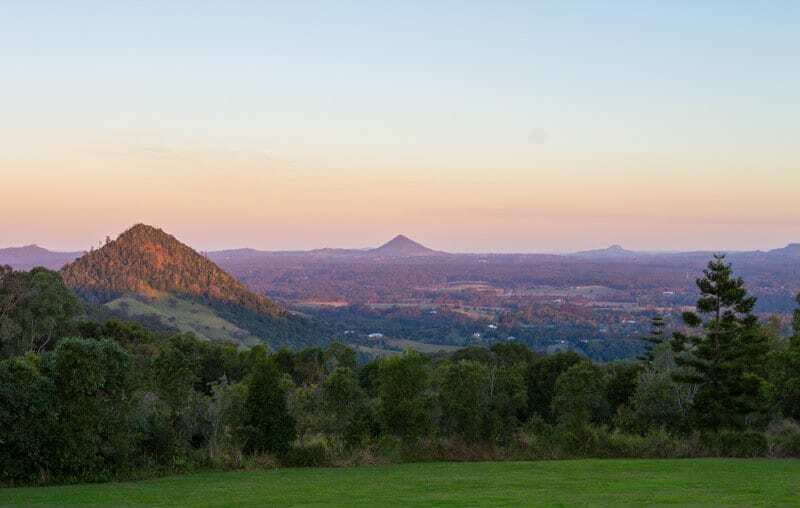 Upon arrival in Noosa Hinterland and through the cute villages we breathed a collective sigh and headed straight to the James Mckane Memorial Lookout in Cooran for sunset. The Sunshine Coast knows how to do a good vista. 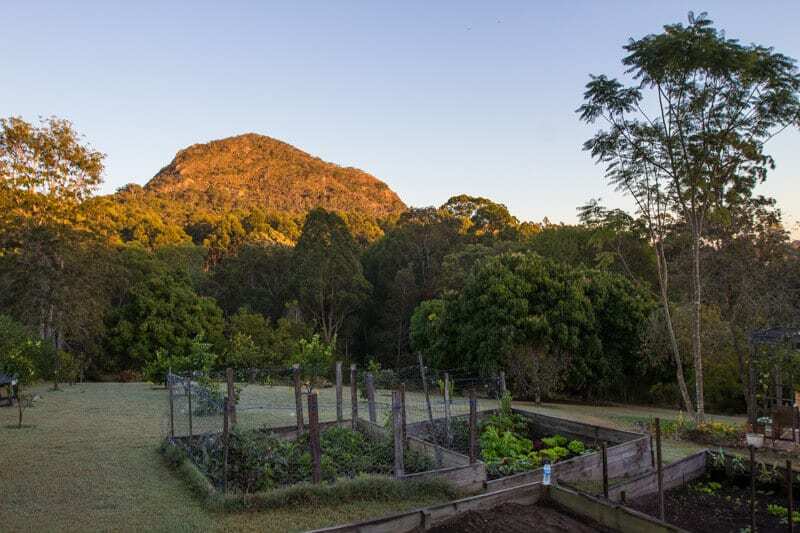 You’ve all heard of the Glasshouse Mountains – those spiritual craggy peaks that arise out of the ground. At this lookout, you get more of the same, but the craggy peak vista is unlike the photos you typically see and are just as stunning. There’s a picnic spot, a few BBQ’s, and plenty of space for the kids to play. 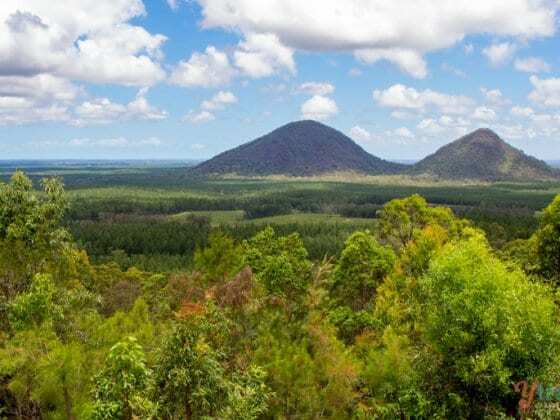 It’s part of the Noosa Trail network which is a series of hiking trails. Our accommodation was set amongst the rolling hills of Cooran on a two-acre property with nothing in between you and the gorgeous Mt Cooran, another one of those craggy peaks rising up from the ground. 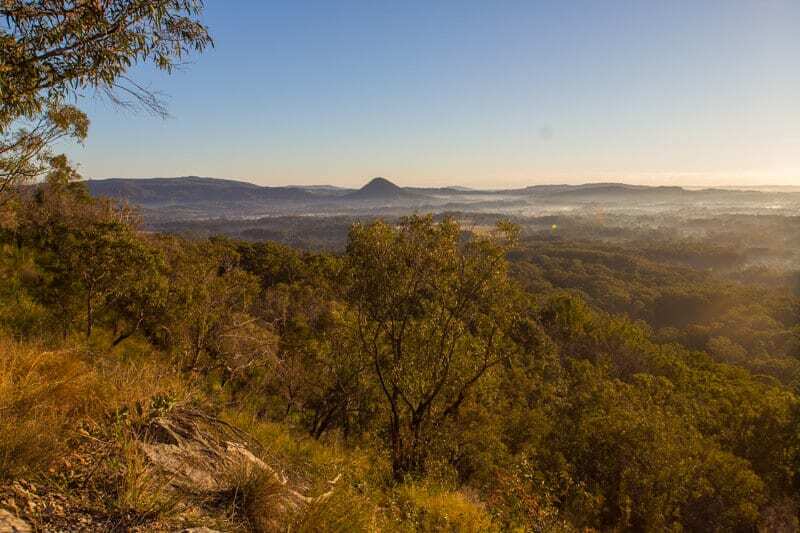 You can sit out with a cup of tea and watch the peak glow in the early morning sun, and although we didn’t see any kangaroos often come to say hi from a distance as well. The owners Liza and David are the sweetest, most hospitable couple. 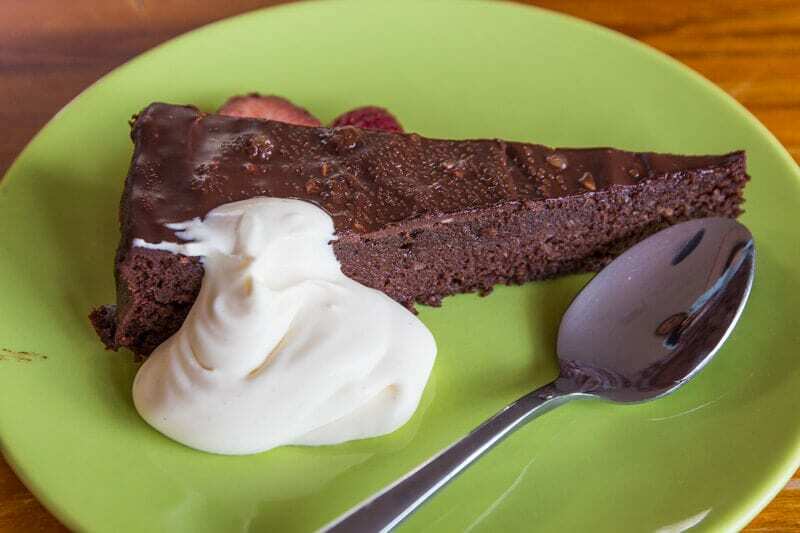 They warmly treat you like old friends and go out of their way to make your stay comfortable with a gorgeous home cooked breakfast and yummy cakes and shortbread for afternoon tea. 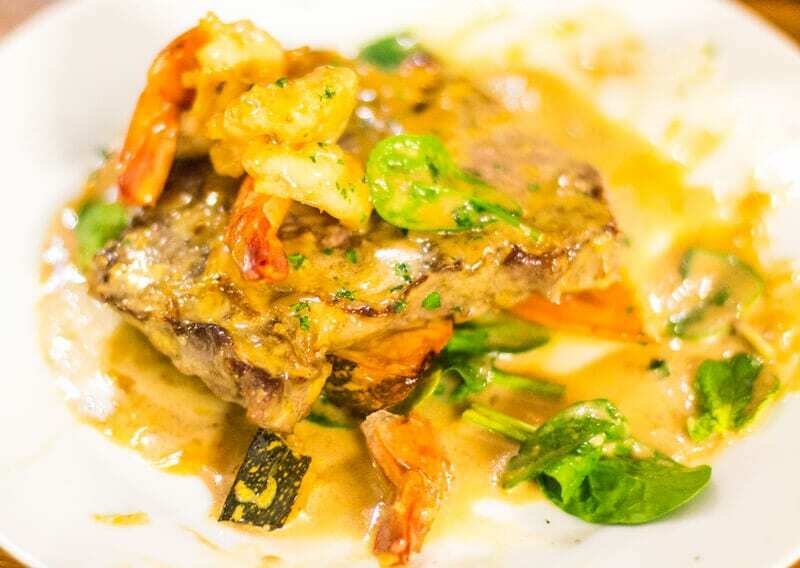 Dinners can also be prepared for you by request at extra cost. 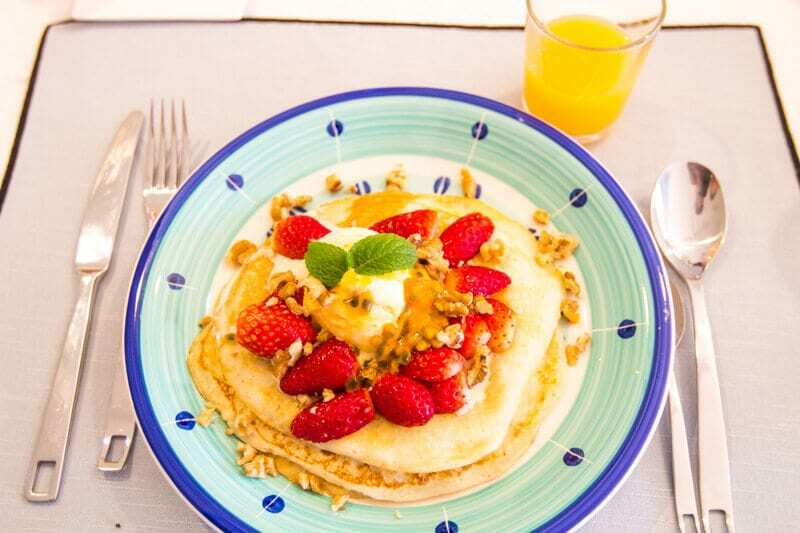 I rarely get to eat pancakes, as mostly they aren’t gluten free and I’m the worst pancake maker in the world, so I devoured a plate of gluten free pancakes topped with passion fruit, strawberries, walnuts and home made ice cream that Liza made. Delicious. We stayed in a private wing of their house with two bedrooms, our own bathroom and living area. Plus the outside patio was ours to enjoy. The morning sun was divine and I could not tear my eyes away from the view of the trees and hills. The girls kept asking us why we weren’t staying longer and if we could. 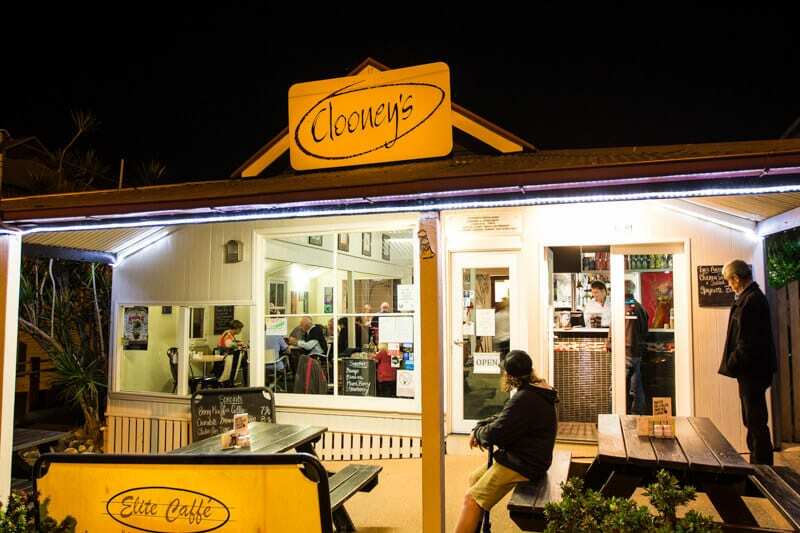 In the village of Cooran is the local’s favourite, Clooney’s Restaurant. It was warm and cosy with views out to the tree lined street. 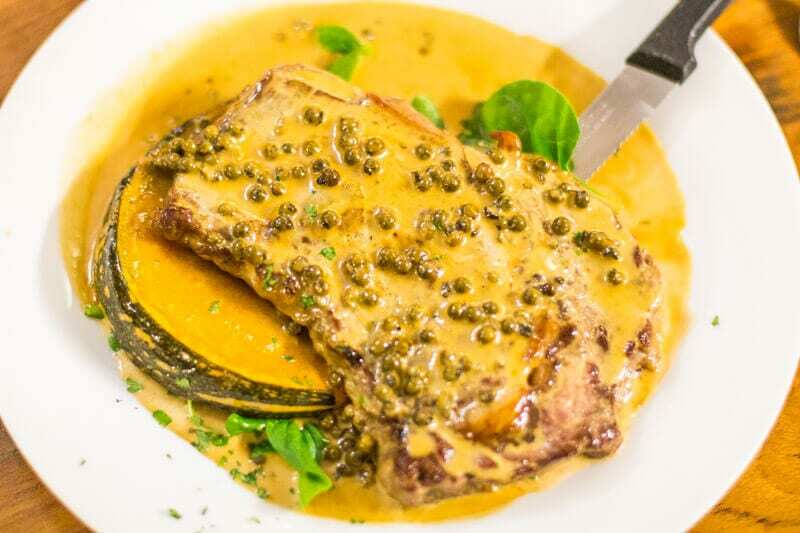 Craig and I both enjoyed a steak, mine was a reef and beef, his a fillet with peppercorn sauce. Best of all was dessert. Craig, Savannah and I all dug into the signature gluten free honey and date cake (we were also told the brownies are homemade and run hot off the shelves!) and Kalyra enjoyed a pavlova. It was a lovely way to unwind out of that Brisbane traffic and drive into Noosa Hinterland. After adamantly deciding she would not be kayaking upon waking, she was now paddling away, grinning madly and having an incredible time. I was just as gleeful behind her. Not just because we were out in the middle of nowhere in a pristine natural environment with only the sounds of the birds flying and the water lapping against our boat, but because I was experiencing this adventure with her. I couldn’t let my four-year-old out paddle me. She was still going. Four years old and she paddled for the entire 16 km trip. 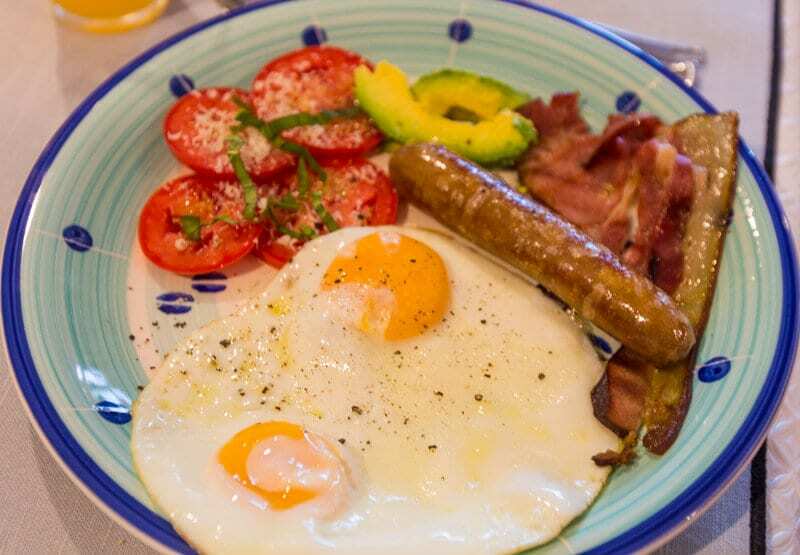 We had a break and a delicious gourmet brunch in the sun. She curled up in a ball, wrapped up in the towel to warm herself up and gather the strength to paddle home. 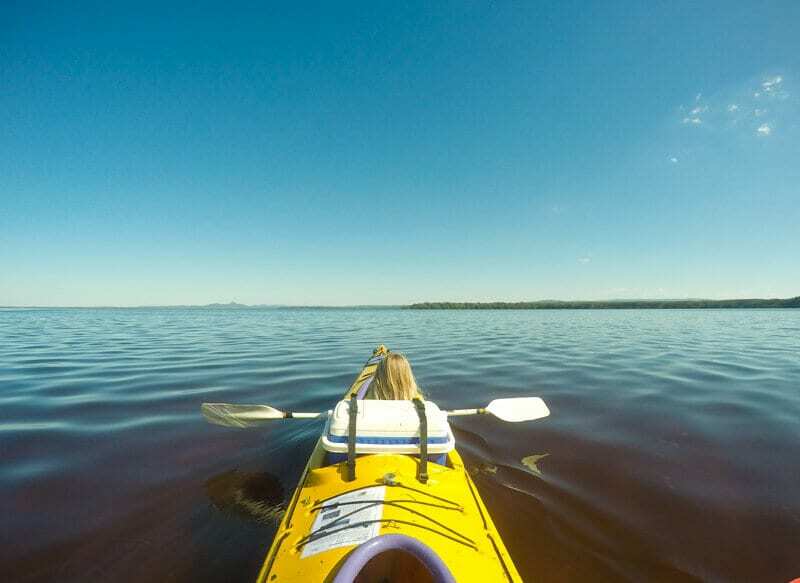 As Vivian, our kayaking guide from Kanu Kapers told us, “You couldn’t have picked a better day to do this.” It was mid-twenties, there wasn’t a cloud in the sky, barely a breeze and the water was so still and glassy. 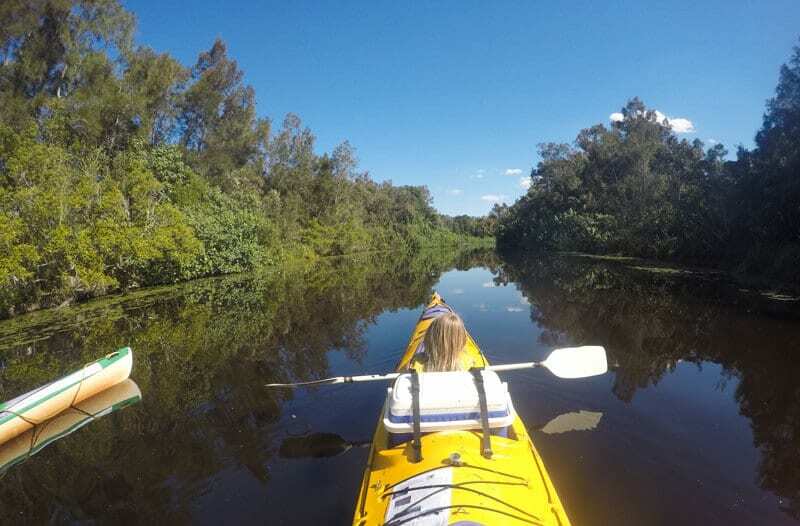 Vivian had us stop for a moment of silence amongst the everglades to absorb that silence and listen to the rising birdsong that this would be one of my favourite experiences in Australia. It’s unique and wild. We barely saw another soul or boat which was so surprising for what it offers out there. 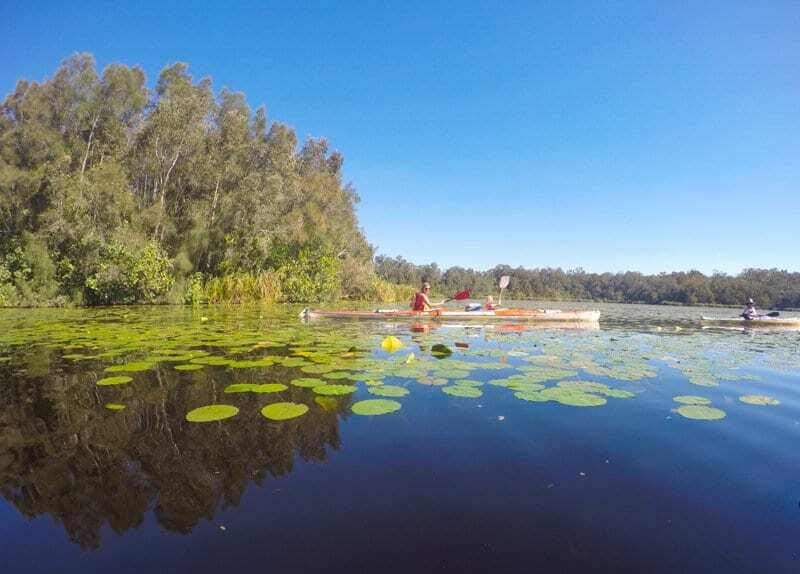 Serenity, wildlife, endless waters, lily pads and reeds to paddle and play in. You almost expect a crocodile to raise its beady eyes at any given moment. Thankfully, this is not croc territory! 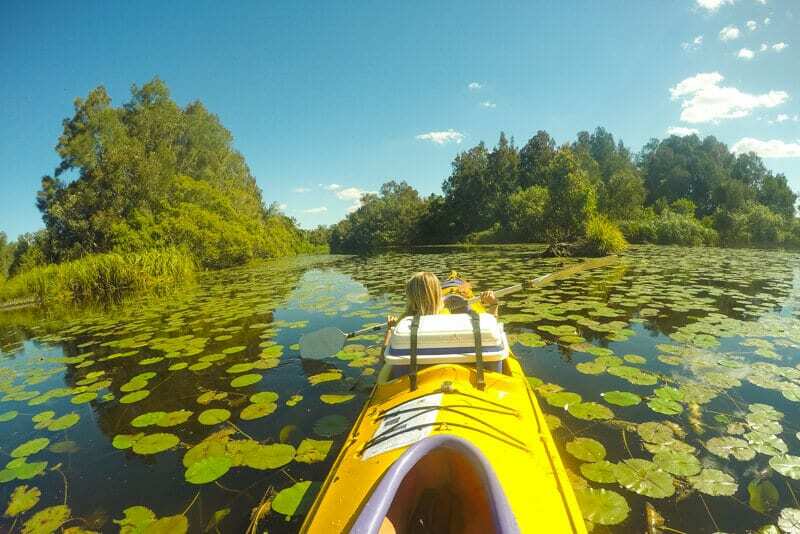 The Noosa Everglades is one of only two everglades in the world. 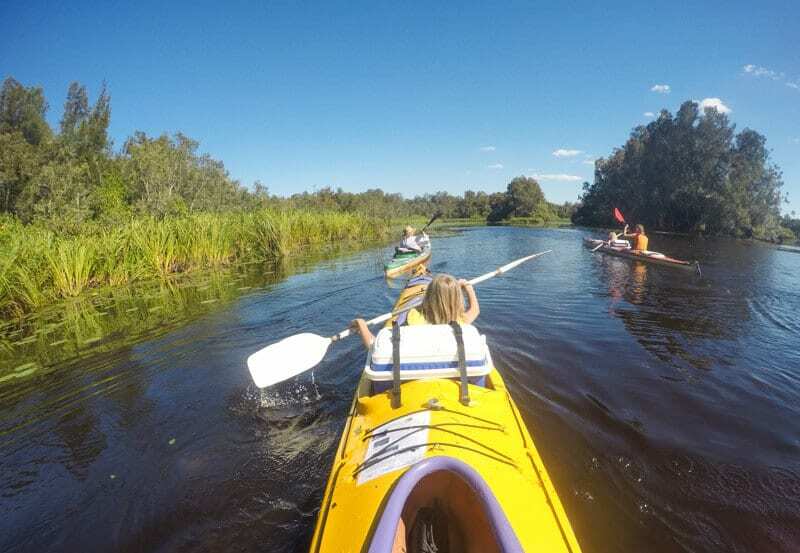 You can hire kayaks and enjoy a self-guided tour or can join a guided tour like we did. 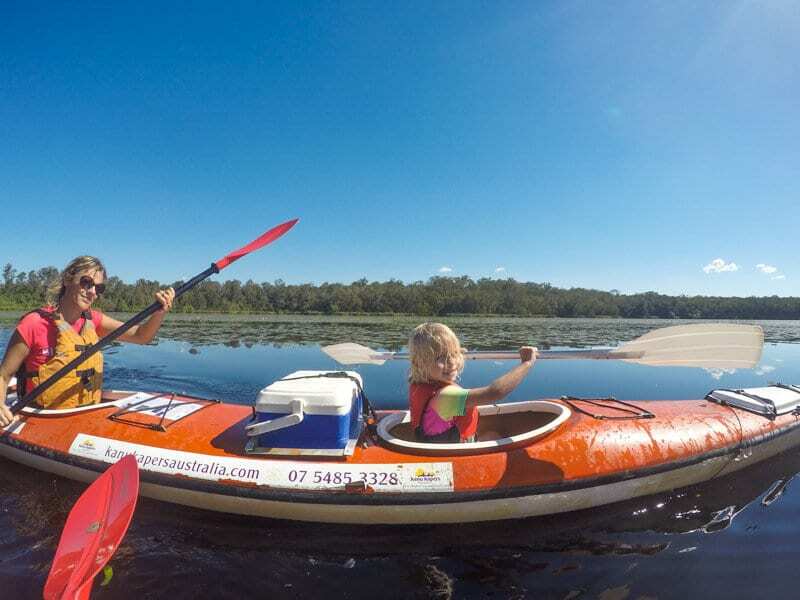 You could be an even wilder adventurer and pack up the kayak with your bush camping gear and head out to the wilderness on a three-day adventure. Me too darling. I loved spending that time with you paddling out in nature and seeing your champion spirit. 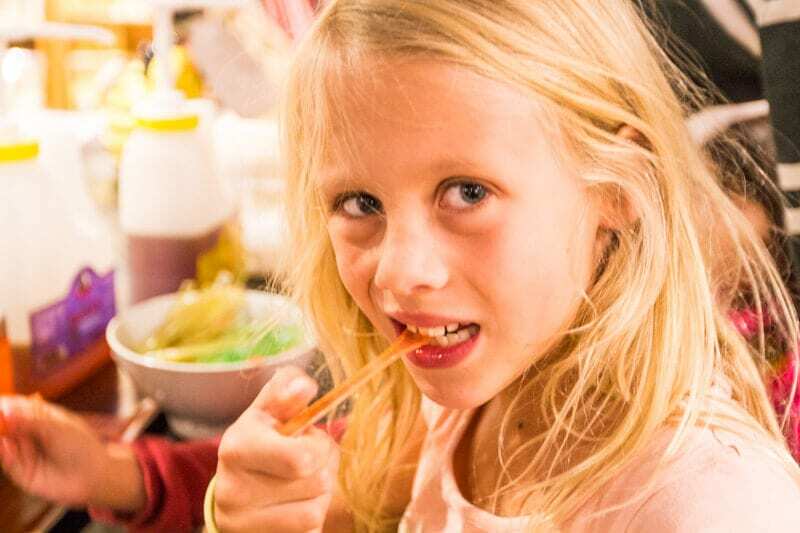 Click play to see more of this amazing experience and our time in the Noosa Hinterland in our video. What a gorgeous little village Kin Kin is. There’s not much here, but all you need is the General Store, come Post Office, come Black AntGourmet Cafe. It was our late lunch spot after kayaking. We were so famished after expelling all that energy that we ordered a decent size lunch. The food was amazing! It’s not the fish and chips food you’d expect from a corner store. It was modern, creative and fresh – and decently sized. They have gourmet burgers which you can have as a wrap or salad. 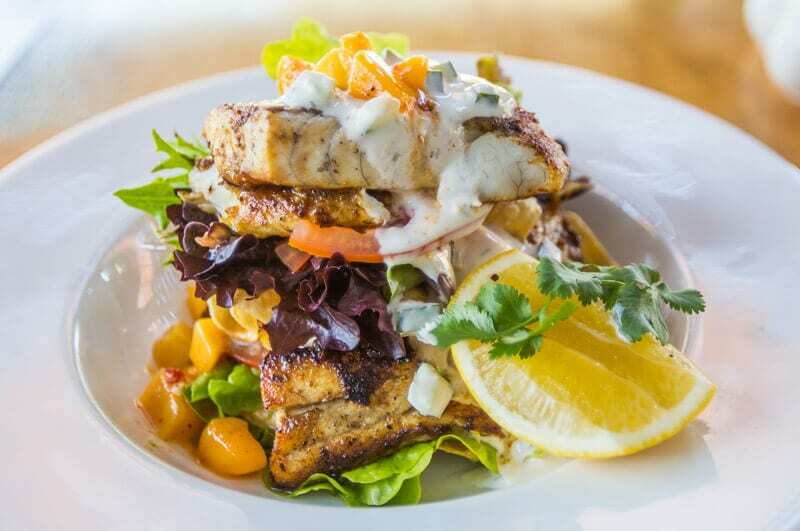 I had the barramundi korma with poppadum and mango salsa salad. 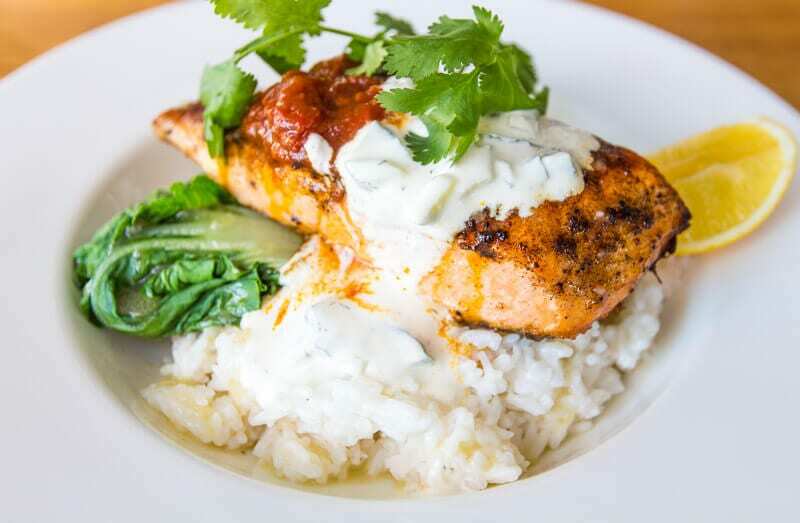 Craig went for the Cajun salmon on coconut rice. You always know a hinterland village place is great when bikers make it a pit stop on their weekend cruises. The General Store also sells local products and free range local grown meats. The restaurant also holds a variety of theme nights through the year. 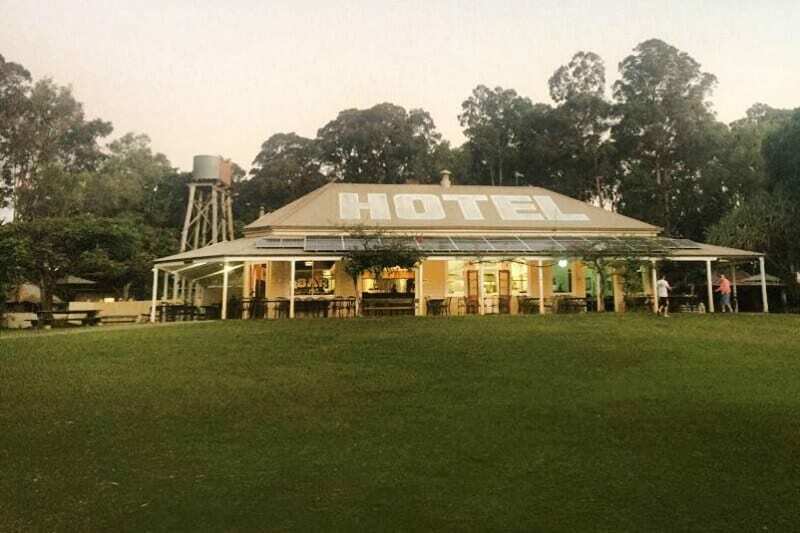 The Apollonian Hotel is a typical Queensland country pub with its wide verandas and set on 3 acres and surrounded by rainforest gardens, and large lawns. It has a historical vintage feel with its fireplaces, high ceilings ornate bathroom decorations and black and white tiled pool room. I think a lot of memories have been made in this pub. We met our friend Cory, form Sunshine Coast tourism for dinner. It was hearty pub grub, sure to warm the heart of any Aussie or international visitor wanting to understand why we love meals like this in settings such as this. It’s full of characters and good stories. The Sunday spit roast is the place where all the locals meet. Our hosts, David and Liza told us how good it was. 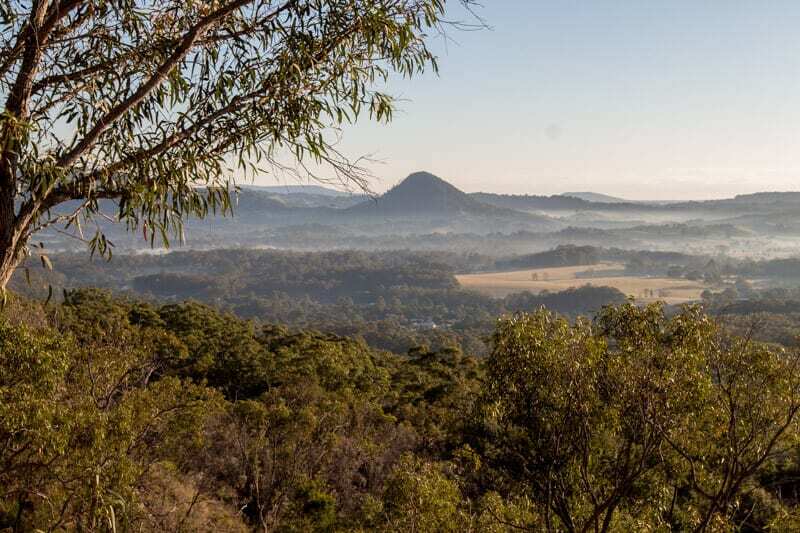 I decided to sneak out early on our last morning to hike up Mt Cooroora in Pomona. It was only an 8-minute drive from our B&B. It was so beautiful to drive through the dales at this time with the mist rising off the green fields and the sky awakening in pastel pink. I left a little later than optimal as I missed the sun rising out of the ocean from the lookout. I got there not long after but enough time for it to be blazing the earth with its power. The thermometer told me it was six degrees, but my vanishing layers spoke otherwise. 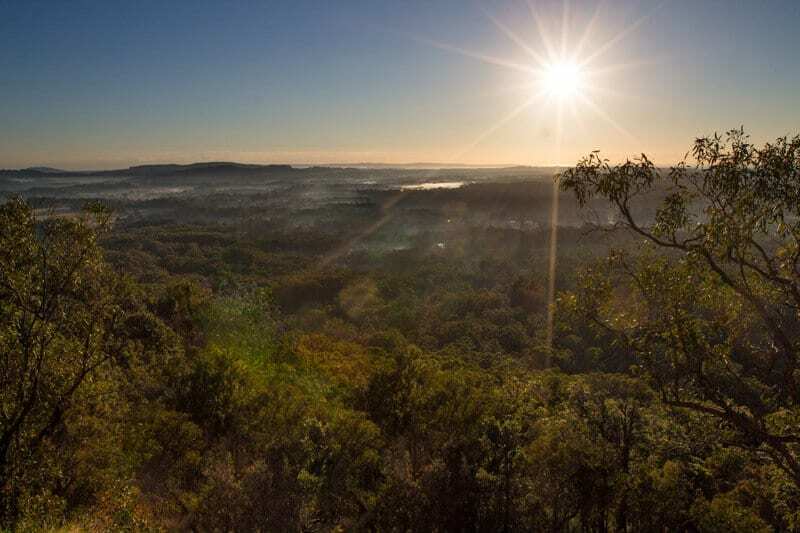 Mt Cooroora is famous for the King of the Mountain race held each year and the weekend before our time in the Noosa Hinterland. The crazies amongst us race to the top – as in run. Now this is a very steep mountain. I did not go to the top, only 1km up to the first lookout. That was enough. I was out of breath and the last bit climbing up to the lookout was steep and accompanied by a chain rope, a rock scramble, and a very steep ladder. I was glad I was on my own and not coaxing the girls up them. Although after Savannah’s super human effort kayaking the day before, she’ probably would have run up it. It was worth it though, the views out over the hinterland across the ocean were stunning. It was nice to sit on the rock on my own and thank the sun for another magnificent day. I was on my own only at that lookout space. Everyone else was on the path running up to the top of the mountain or running back down. And I as worried I was going to be the only one walking through the forest and up the mountain. It wasn’t only super fit either. Young children and elderly passed me by as well. Made me feel a little self-conscious and determined to be the King of the Mountain…next time! 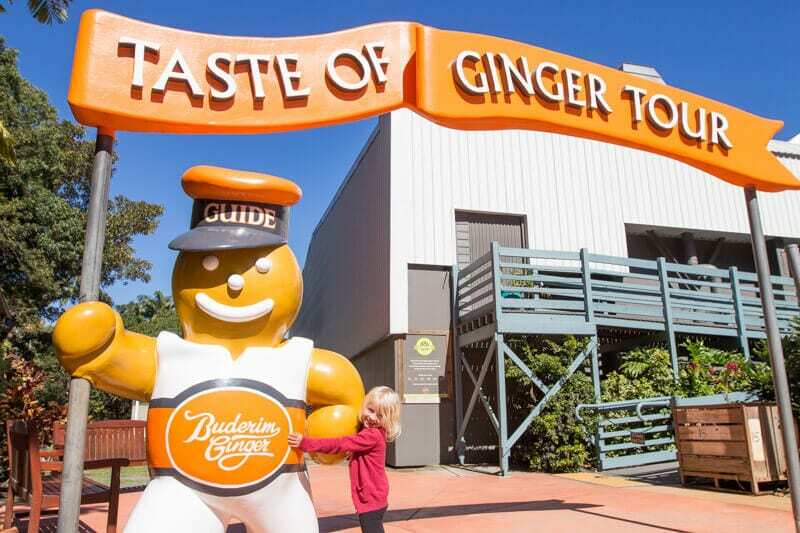 I drove past the Ginger Factory in Yandina almost every weekend for 18-months when we lived in Mooloolaba and I’d visit the Yandina farmers markets of a Saturday to stock up on fresh produce. I didn’t like ginger back then, which is the only reason I can explain never visiting. 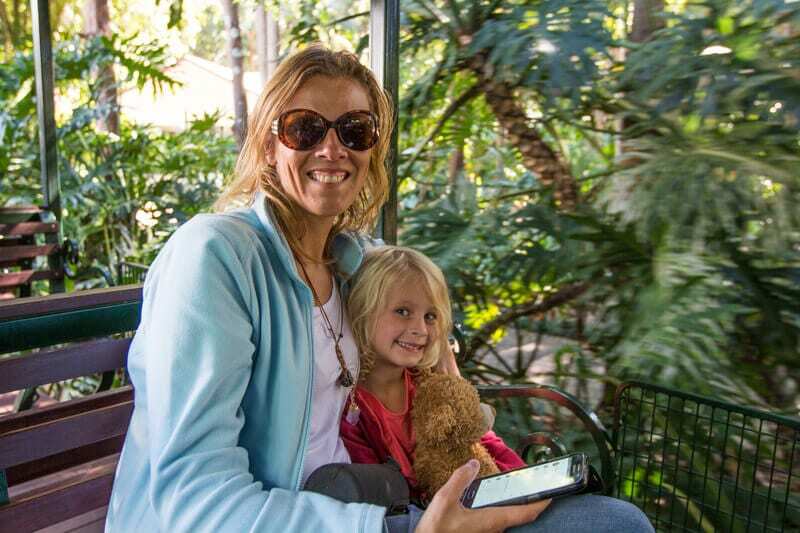 It’s a popular tourist attraction and even for locals who visit regularly with their local passes for a coffee with friends in the cafe while their kids play in the playground and take endless boat and train rides. The setting is just gorgeous, and now that I love ginger, I was really excited to visit. 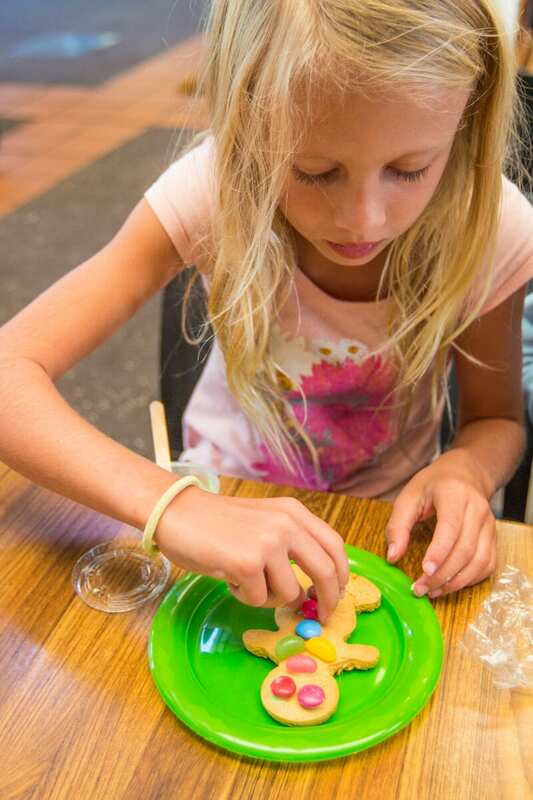 We started at The Ginger Cafe with a taste of ginger scones with ginger tea and cream, whilst the kids decorated their ginger bread men. Divine. 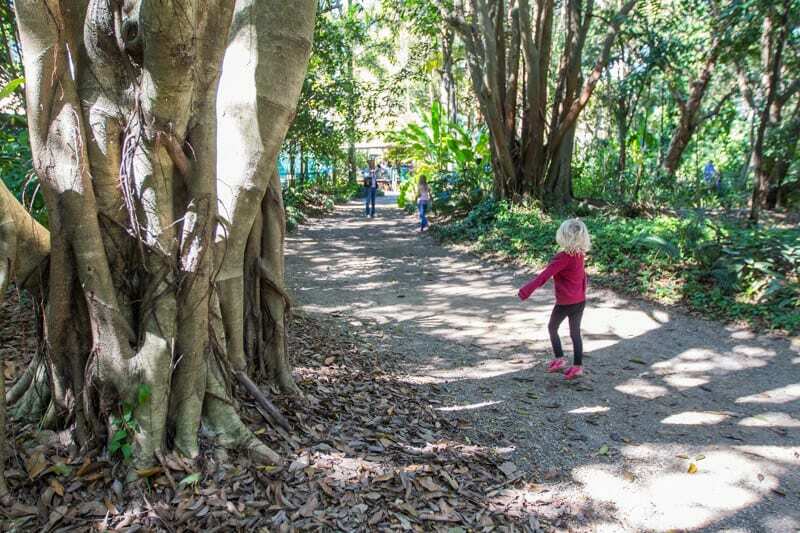 We took a walk through the rainforest and then jumped aboard the steam train for a ride around the property, through the rainforest gardens and past the sugar fields to learn all about the ginger factory that started as in Buderim as Buderim ginger with ginger beer. I was sure to grab an ice cold one from the fridge on the way out. It was delicious. Years ago I would have shuddered at the thought of drinking one of those, now it’s the only soda drink I treat myself with every now and then. My favourite experience was Kalyra’s transformation from pouting, “This is so lame” upon boarding the Overboard boat ride, to exclaims of delight at how cool it was as we sailed on by the displays of different nations around the world. The Kiwis were doing the haka, the French the Ginger Rouge. In each display was a hidden Gingerbread man you had to find. Always try things first before casting judgement Kalyra! 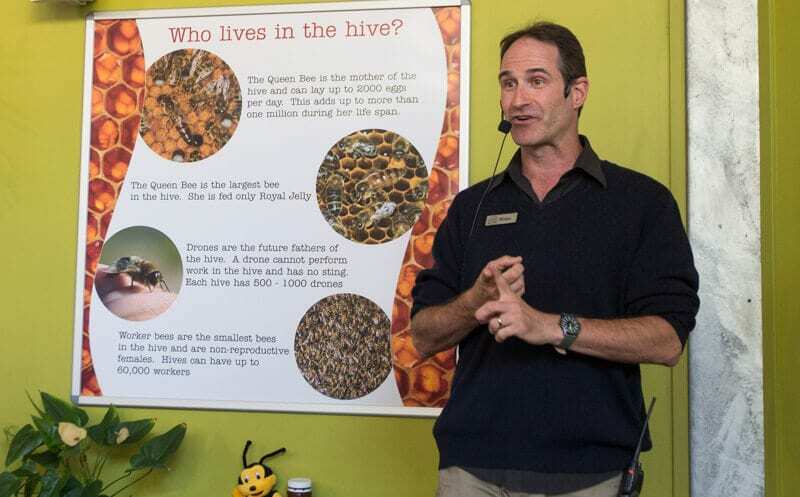 My true favourite experience was the Bee Talk. 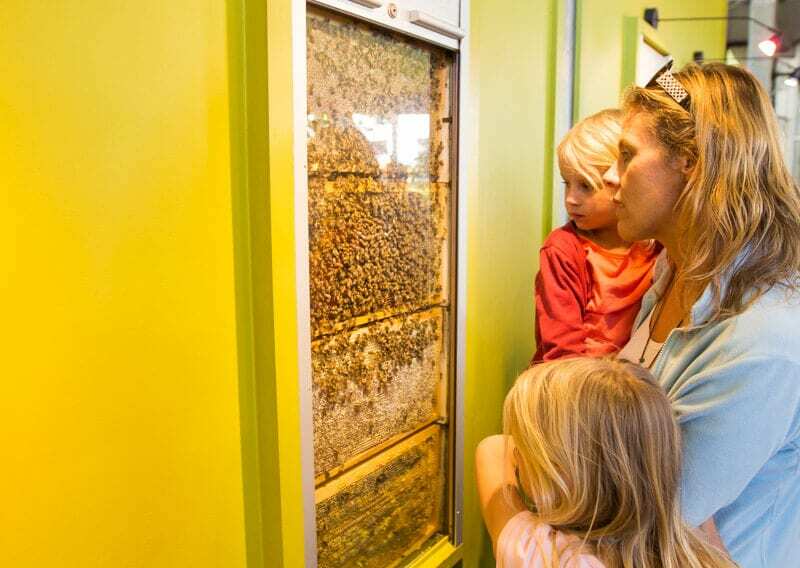 We’re now all in love with bees. Seriously. 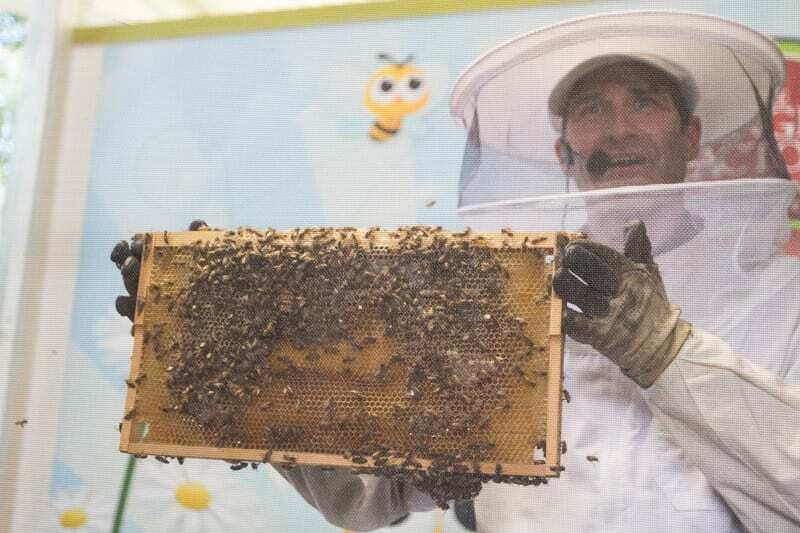 The had bee keeper almost had us signing up to become bee keepers and find our Zen. In case you didn’t know, without the bees life would be dead within a few weeks. 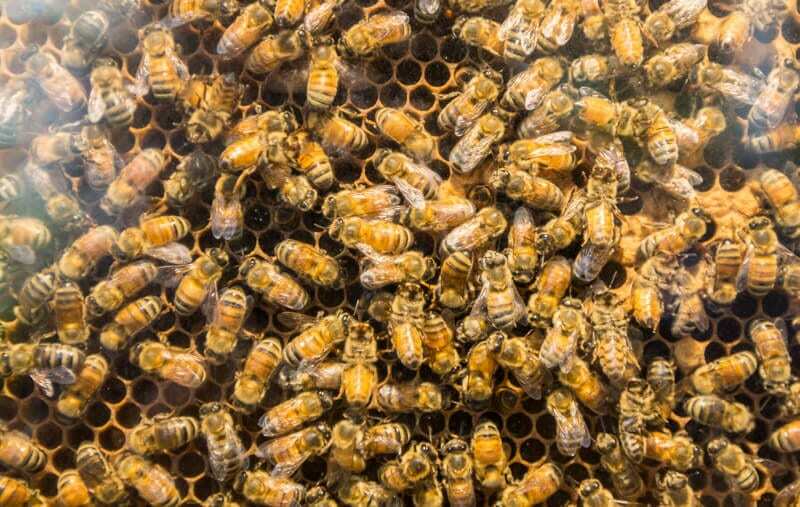 The bees are responsible for our food. Love the bees. Look after them. If you can’t keep a hive and make your own honey, then plant lots of flowers and don’t waste water. Don’t worry about us taking all the bees honey. They make too much of it and are constantly working to keep making it. That’s all they do for their short six-week lifespan is make honey all day long. It’s the lady bees that do all the work too. If you’re scared of bees and one comes near you, just remain still, she’ll soon work out you’re not a flower and leave you alone. 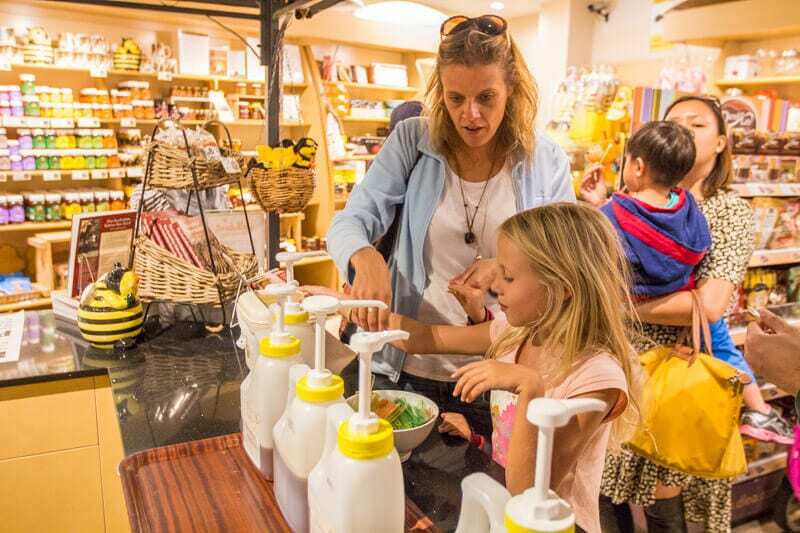 After a honey tasting seesion we grabbed ourselves some bee pollen and Manuka honey from the store on the way home and it’s now a part of our regular health routine. Yep. Super food max out! You know that’s how we roll. 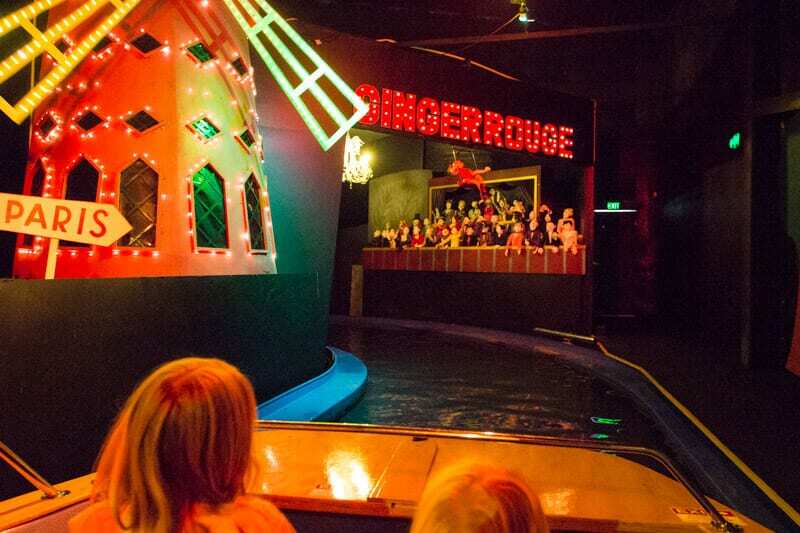 There are also tours of the ginger factory which we didn’t get time for. And of course what visit to the Sunshine Coast would not be complete without a stock up at Costco on the drive home. This post is sponsored by Logitech. To get all the details about the Zero Touch click here. 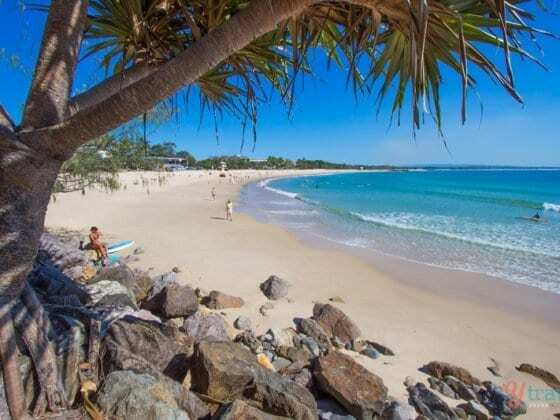 And to get more details about visiting the Sunshine Coast go here. 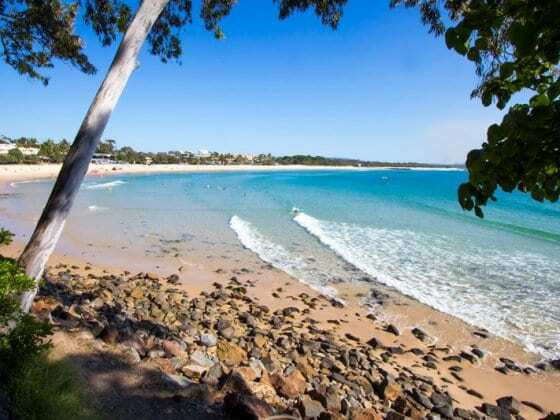 I wish I’d spent more time in Noosa. It’s such a beautiful area! Totally. 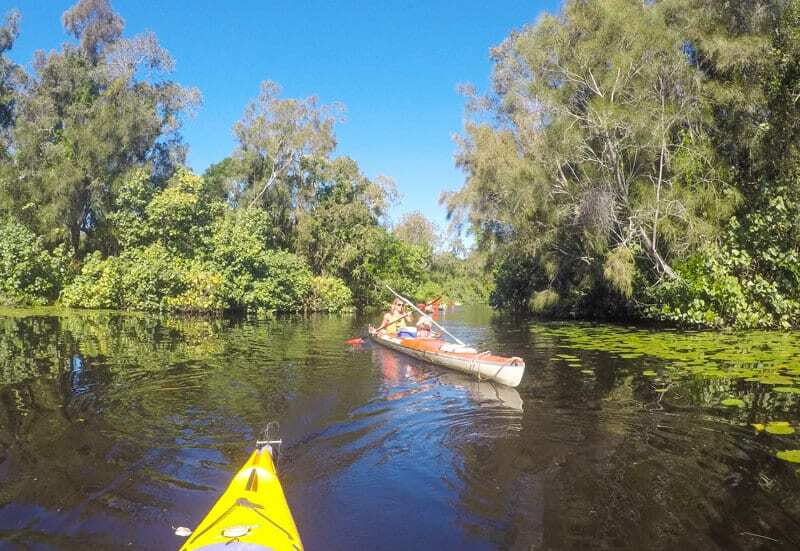 That kayak trip in the Everglades was awesome, and we love exploring hinterlands! 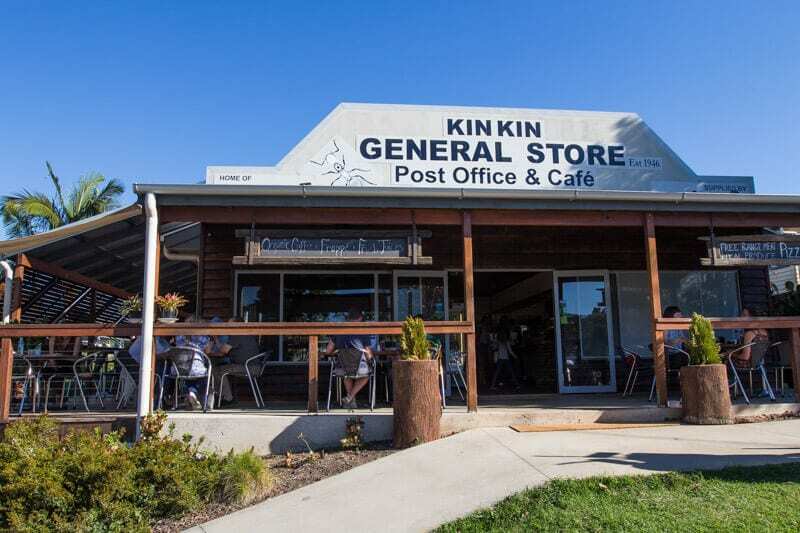 Kin Kin General store was a winner. Yes, I do need to update from my Galaxy 4 to a new model. It’s on my list of things to do.